Are you a student, teacher or lecturer? If you are, it's your time to take advantage of that privilege. You better act now and know what Apple has added to their store rather than their applications and products. They have a new service called the Apple’s Education Store, which a discount for folks within the education institutions. It is so unfortunate that most customers aren’t aware of this good fortune. As a matter of fact, people should not miss this information especially in an area where Apple throws the education banquet so wide. You better act now and pick up your Mac for students. Do you have some questions answered? Well, continue scanning the whole of this article, and you'll have you'll have all of them narrowed down. 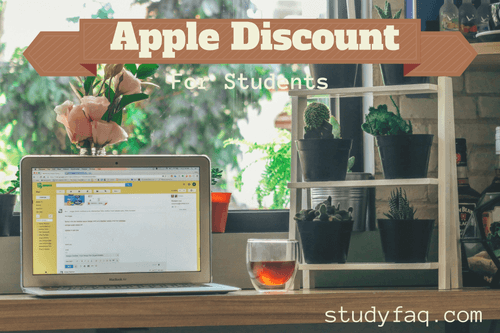 Student FAQ: Who fits for an Apple education discount bid? The answer is anybody who operates within a school environment is eligible. As far as you are a student or a teacher, you have access to the cut on Apple computers. Wait, this deal is not only limited to lecturers, students, and educators, even other administrative employees, and the non-teaching staff are also welcome for the discount. For parents, there is a little game to play. Parent do not qualify if they are purchasing for themselves, but they qualify when they are buying for their children. Those are the Apple terms. The next thing is that there is no business idea or plan here! The discounts are restricted for education purposes only, not for purchasing and reselling to earn a profit. How am I going to get my student Apple discount from the Education Store? The first thing, are you qualified? If you are, it's very simple. Pay a quick visit to the Apple Store for Education on the Apple Website. When you get there, use UNiDAYS to win your access to the Apple Education Store. Signing up should never be a puzzle. Enter your email, then a password, follow with the name of your institution, your subject of study, the year of study and the course length. It's pretty straightforward. Alternatively, if you're not a fun of scattering your personal information while registering, you can use the Apple, use Apple's Chat online, and one of their staff will be with you. Student FAQ: What discounts should I be preparing for on the Apple Education Store? For your information, this is not the ordinary cut that comes in the form of a ratio and percentages like buying a car or pot. With Apple, you will only find prices set for each product range. The only discount available is for Mac computers. All in all, no special discount for other products. But you will still love everything they offer even without a discount. What are the Mac Students Discount? The standard price of MacBook Air is $935.50, but you'll get it at $879.80 from the Education Store. The 12in MacBook goes for $1,232 all the way from $1310.20. The MacBook Pro with Retina Display begins at $1123 coming down from $1548. The iMac start was at $1123, but you'll get it at $1055. The Mac Pro at Education store starts at $2872, but the standard price starts from $3123. Lastly, the Mac mini at education store starts at just $469 rather than $498 in the standard price. Please note that these prices are ranges, you need to visit the site to see the other series. Are there iPad student discounts? True there is. The iPad Air 2 from Education Store starts at $418 rather than $435 for the standard price. Additionally, the iPad mini 4 begins at $382 instead of $398. The iPad Pro starts at $598 all way down from $623. There are no available discounts on iPhone, Apple TV or Apple Watch. To sum it up, you need to know that all these prices include a VAT which comes at20%. To fit for the discount, you'll have to prove that you are a student or a staff within an education institution. From there, you will be allowed to enjoy your Apple privileges. Furthermore, Apple has also launched a student membership scheme that caters for Apple Music. As a full-time student or staff, you will be able to receive a 50% discount on the music streaming subscriptions. It's time to get whatever you need now with Apple Company. You better hurry for your quick deal.